Having an online store is an integral part of any businesses future growth. Ripe web design has a large selection of professional E-commerce templates for you to choose from template section. Your online store will have a fully functional administration and logistic systems built in, that will allow you to track and modify orders and store customers contact details for future offers and promotions. Would you like to sell all your products online? Ripe can build and design your online store to your exact specifications. "The quality and service far exceeded our expectations. We are delighted with the final product which was completed before time and on budget." Our team will also re-design the top banner of the E-Commerce Template to suit the look and brand of your business. 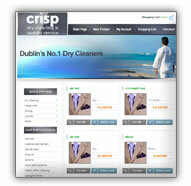 Our web designers will upload 100 of your products or services directly to your online store. If you require additional products to be uploaded, there is a small fee of €2.00 per item. Home Page, New Products, Specials, My Account, Contact Us.